Note: In December 2002, Brian Baker became the first American since Andy Roddick to win the Boys' 18s title at the Orange Bowl. Few boys have dominated the USTA national rankings the way Brian Baker has. For years he has remained in the top three of the national rankings, at times holding the number one position in Boys 18s and 16s simultaneously. Though just 17 years old, Brian has been winning titles in the 18 and under division for the past two years. The reign of Brian Baker began in 2000. Even though he had been within the top 10 throughout his time in the Boys' 14s, it was his entrance into the older divisions that brought him the most recognition. Brian won the Columbus Indoors, Interscholastics and Easter Bowl to start the first year of the new century. In 2001 he proved he was here to stay with a win at the 2001 Chanda Rubin American Circuit as well as finalist and semifinalist positions at the Kentucky Internationals, the USTA Super National Hardcourts and the Eddie Herr Internationals. This year was also a good one for Brian. 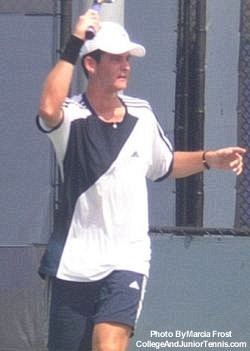 He won the doubles title (with Brendan Evans) at the Astrid Bowl, where he was also a singles semifinalist. He reached finals at Junior Wimbledon and the Australian Hardcourts as well as semifinals at the USTA Super National Hardcourts and the Target Cup. I sat down with Brian Baker at the US Open, where he also made quite a showing. He lost in the first round of the Men's Singles Qualifying, but Brian made up for it in the Junior Championships. He made it to the third round of the singles event before losing a tough match to Dudi Sela of Israel, 7-5,6-4. Last -- but certainly not least -- Brian teamed up with Australia's Chris Guccione to make it all the way to the doubles finals. They lost a close 6-4,6-4 to Michael Koning and Bas Van der Valk of the Netherlands, two players who had often teamed together. Q: During your match (with Dudi Sela) you called for a trainer. What was that for?